We’re back reviewing more vegan cheeses because even when the ‘cheese’ is gross… at least it’s entertaining. I love cheese and it’s something I really miss as a vegan. Fortunately, some clever folks have acknowledged and filled this niche market. If you’re looking for reviews of cream cheese or other traditional cheese substitutes we’ve got those covered. Bacon is NOT an Herb also has a comprehensive review of some vegan cheeses. Now on to the new reviews. Daiya Daiya started making “wedges” as an alternative to their indispensable shreds. We tried the cheddar, jack and havarti with jalapeño and garlic. We tried the jack first. It blew both of our minds the minute we put it in our mouths. It’s cheese! It tastes just like mid-priced jack cheese. It melts into a molten cheesy liquid that would be better as a dip, not so great for grilled cheese (try Follow Your Heart mozzarella instead for sandwiches: it’s usually cheaper and lower calorie) but their shredded Daiya is an excellent stand in for cheese that needs to be stretchier instead of melty. We put the havarti with jalapeño and garlic into the microwave and used it as a dip for corn chips. It was creamy, cheesy, spicy and gone in just a few minutes. Side note: the packaging doesn’t say “not microwave safe” or “do not microwave this container” but we can assure you, it should. The cheddar rose to the Daiya standard and was distinctly cheddar and delicious. We ended up mixing it with salsa and microwaving it for queso dip. It’s dairy-, gluten-, soy-, and nut- free, except for coconut. The ingredients were processed and it has about the same nutritional profile as regular dairy cheese in terms of fat but without the cholesterol. I wouldn’t say it’s particularly good for you but it’s an excellent comfort food and doesn’t give me pimples like dairy does. They were $6 for just over 7 ounces, possibly less at your local market. I think it’s a good value. 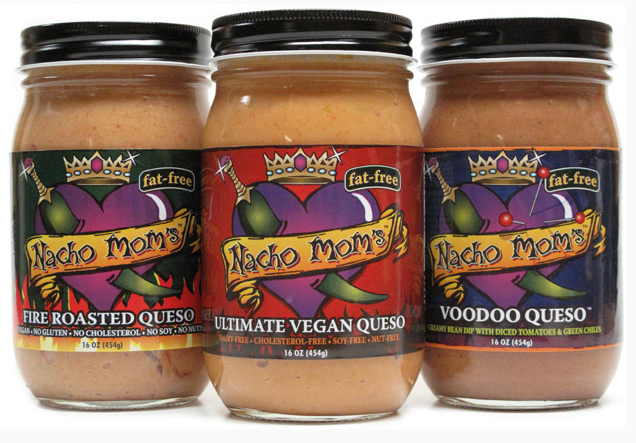 Nacho Mom’s Vegan Queso This brand comes in 3 flavors, one of which contains gluten. We tried their spicy gluten-free flavor, “Voodoo”. It wasn’t particularly spicy and wasn’t so much queso as bean dip. Based on the ingredients, nutrients, low calorie count, price and that it was delicious enough to convince two omnivores, we’d definitely buy it again and recommend it again. Their line is soy- egg- nut- and dairy-free and all but one flavor are gluten-free. It costs $5.50 for 15 ounces. Punk Rawk Labs We tried their cashew line because the macadamia nut and cashew/mac lines were more expensive and we needed some convincing. We were VERY convinced by the cashew varieties. The smoked cashew was lightly smoked and very creamy and cheesy. The “plain” is anything but plain. The herb was lightly coated with herbs and delicious. Any of these would make an excellent substitute for goat cheese. They didn’t include any nutrition information on the packaging which made me sad but the ingredients themselves were all minimally processed and inoffensive. It reminds me of Dr. Cow for the great raw ingredients and excellent presentation. Being convinced we went ahead and bought the macadamia nut cheese and the blend of cashew and macadamia nut cheese. VegCuisine I tried the Mediterranean Herb Feta and Blue Cheese alternatives and wasn’t impressed. 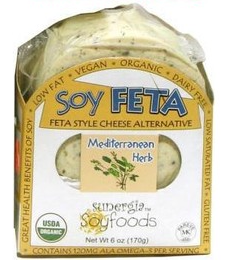 The herb feta was definitely herb but not feta. The blue was also bland. The flavor reminded me more of halloumi than their namesakes. The texture was crumbly bordering on a rubbery feel in my mouth, also reminiscent of halloumi. They were decent additions to salad in terms of adding some texture, nutrition and a vehicle for the salad dressing. I did like most of the ingredients and calorie contents (about half that of traditional cheeses). It cost $4.50 for 6 ounces. I might buy it again for the value, mild flavor and the low calorie count. We Can’t Say It’s Cheese Wayfare foods makes cheese spreads in 4 flavors. We tried cheddar, Mexi-cheddar and hickory-smoked cheddar. Their hickory-smoked cheddar was distinctly hickory-smoked with a mellow cheesy flavor. The Mexi-cheddar and cheddar were also mild and cheesy but didn’t taste particularly different from one another. We did some damage control and came out with something that was both cheesy and spicy. They don’t need hot sauce to be tasty but we’re all about melt-your-face-off spicy food. It’s 50 calories per 2 tablespoons and the ingredients are fairly processed but they’re soy-, gluten- and nut-free. It cost us $5 for 8 ounces. I would buy it again: it’s low calorie, the flavors are good, it’s a good value for what you get and it’s got some reasonable nutrition to offer like [among other things] calcium and iron. I might even use it instead of cream cheese on toast or in nori rolls! So this is where the Cheese Post 3.0 has led me: Diaya makes indispensable shredded cheeses and delicious wedges that aren’t particularly good for you but will fill that void for comfort food that dairy cheese used to fill when snacking. 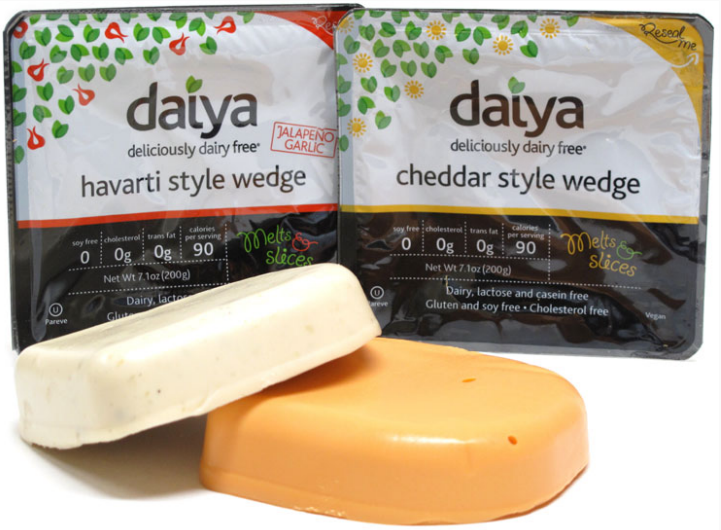 I would buy Daiya wedges for occasional snacking and their shreds for pizzas, quesadillas and burritos. 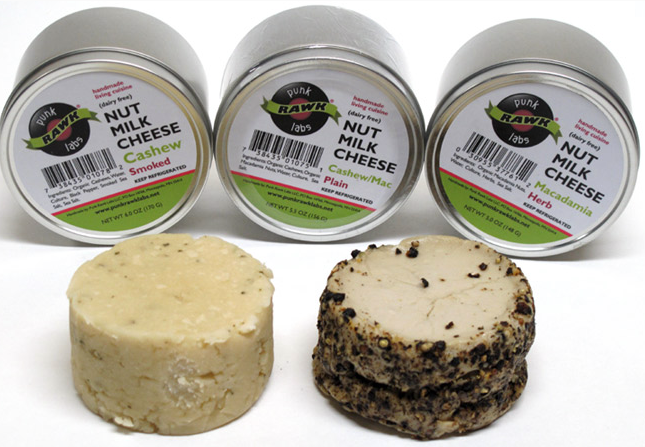 Punk Rawk Labs and Dr. Cow make delicious cheeses that are good for you. I would buy it as an appetizer for a nice dinner with guests. Follow Your Heart and Teese make mozzarellas that are fabulous for baking and grilled cheese, are cheaper and lower calorie than some of the competition. 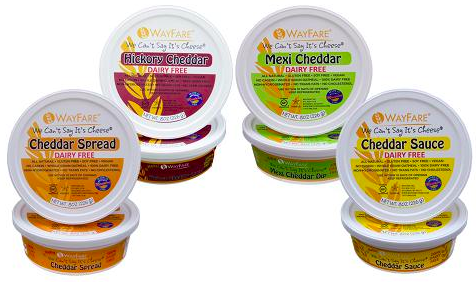 Wayfare Foods and Nacho Mom’s make great low calorie dips and spreads. Tofutti cream cheese wins for health and value in the cream cheese department. 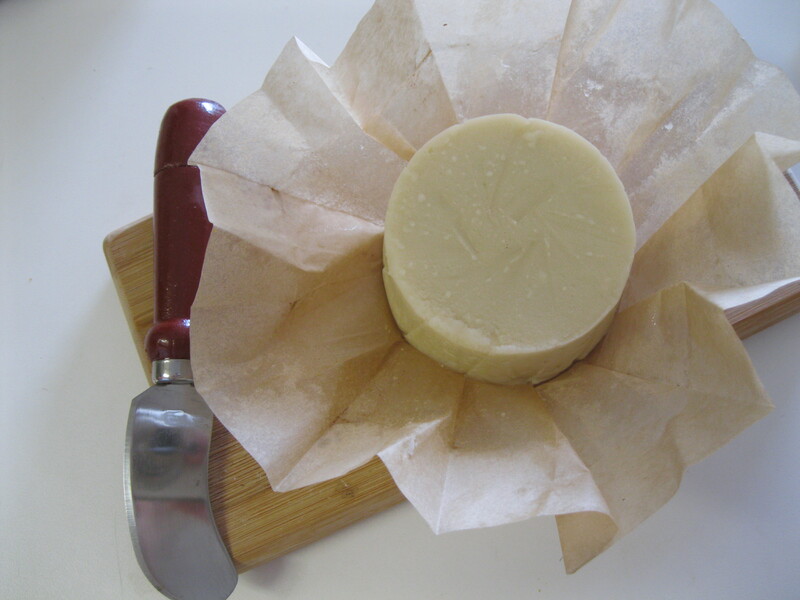 Eat in the Raw makes a great parmesan style topping for pastas, pizzas, vegetables or whatever you’d normally sprinkle a little parmesan on except that this is a healthful alternative to dairy parmesan. This concludes this installment of the Cheese Posts. We hope you find the good stuff!